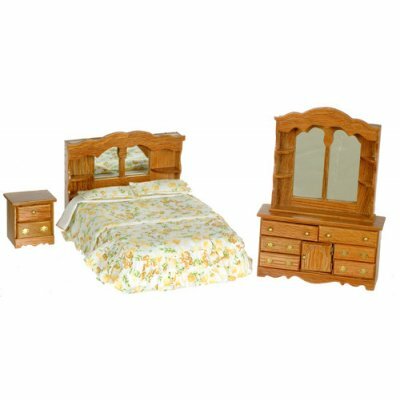 This dollhouse miniature double bedroom set has 3 pieces; the bed; the nightstand and the mirrored dresser. The 1:12 scale bedroom set is wood construction with a dark Oak finish. The drawers/doors are all working and the linens are included. - Bed measures: 4.5" by 7" by 5.25"; Dresser with mirror measures 7" by 4.5" by 1.5"; the nightstand is 2" by 1.75" by 1.5". This Double Bedroom Set 3pc Dark Oak is supplied by Aztec Miniatures, which generally ships within 8 business day(s) of you placing your order .